Lorrain Baines: There, there, now. Just relax. Lorraine Baines: You’ve been asleep for almost nine hours now. Marty McFly: I had a horrible nightmare. I dreamed that I went… back in time. It was terrible. Lorraine Baines: Well, you’re safe and sound now, back in good old 1955.
Who can forget the classic film, Back To The Future? 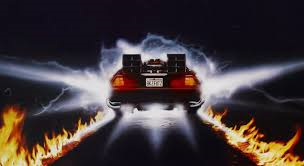 Marty McFly, a typical American teenager of the 80’s, is accidentally sent back in time in a plutonium-powered Delorean time machine invented by the slightly mad scientist, Dr. Emmett Brown. Marty’s often hysterical, always eventful trip back in time is one for the ages. In the spirit of Marty McFly, I’d like to embark on my own journey back in time. My year of choice is 1994, the year I graduated from college. Unlike Marty McFly, whose primary mission was to make certain his teenage parents-to-be meet and fall in love, my mission is to impart some wisdom into a younger, more confused version of myself. So, let’s power up the Delorean and go back in time. Congratulations on your recent graduation. I’m so proud of your accomplishment. As you’ve heard countless times, the “real world” is about to begin. The knowledge you’ve gained during your four years of college is certainly valuable, but in no way has it prepared you for life. You see, regardless of the profession you choose, there are going to be peaks and valleys on the proverbial road of life. As you embark on this journey, unsure of what you really want to do, I want you to consider three important pieces of wisdom, which will ultimately shape who you become. Every minute you spend worrying is 60 seconds of potential happiness lost. I know that you are a self-described worry wart, so this may seem quite confronting to you. Please know that worrying is like paying interest on a debt that hasn’t come true. In other words, all of your worries are about things that haven’t happened yet. These worrisome thoughts take up a tremendous amount of space in your mind, which leaves much less room for positivity and optimism. I know you are worried about the next steps in your life. Where am I going to live? What is my profession going to be? How much money will I make? While these thoughts are very real, they can also be a source of great hope. Have faith that God will ultimately answer these questions. Trust in the process and embrace every moment. Rejoice in your failures and use them as a source of emotional resilience. Unfortunately, you just spent four years in a system of higher education where failure was simply not an option. You were conditioned to believe that the most successful students are those who achieve the highest grades. This couldn’t be further from the truth. You see, there is no such thing as failure. There are only results. Whether you finished with straight A’s or straight C’s, it’s your emotional intelligence that will serve as a key ingredient to your success. Take, for example, your math class that you struggled mightily with. While some may show pity and feel sorry for your challenges, I want you to embrace it. Although you didn’t get an A in the class, you did get life skills such as grit and emotional resilience. You won’t receive a grade for grit on your report card, but let me assure you that it will prove to be more important than any of the letter grades that show up on your college transcript. Stay true to your passion, not your paycheck. I know that the pressures of landing the perfect job as a college graduate are immense. I also know that your heart says you should follow your passion, which is empowering kids, yet your head says you should find the highest paying job possible. Believe me, this is a very common battle for college graduates. Unfortunately, it’s easy to follow the herd and race into the corporate world, eager to buy your first house and drive a fancy car, both of which are status symbols that supposedly convey to others that you have “made it.” I implore you to look beyond the instant gratification of cars and houses, and ask yourself this question, “What can I do to fuel my passion?” I promise you that when you choose to fuel your passion, the extrinsic status symbols won’t matter. Why? Because you will be intrinsically rewarded beyond measure. Feelings like happiness, joy, fulfillment, and contribution will replace the material things and the quality of your life will drastically improve. P.S. With regard to your worries about a future spouse. God has the perfect person for you. Make sure you buy lots of sunscreen, because you’ll have to move to Arizona to meet her.